You must get a permit to do this route. The National Park Service limits access to Echo Canyon to 12 people a day. For more information on canyoneering permits and reservations, please see the Zion Wilderness Permits website. 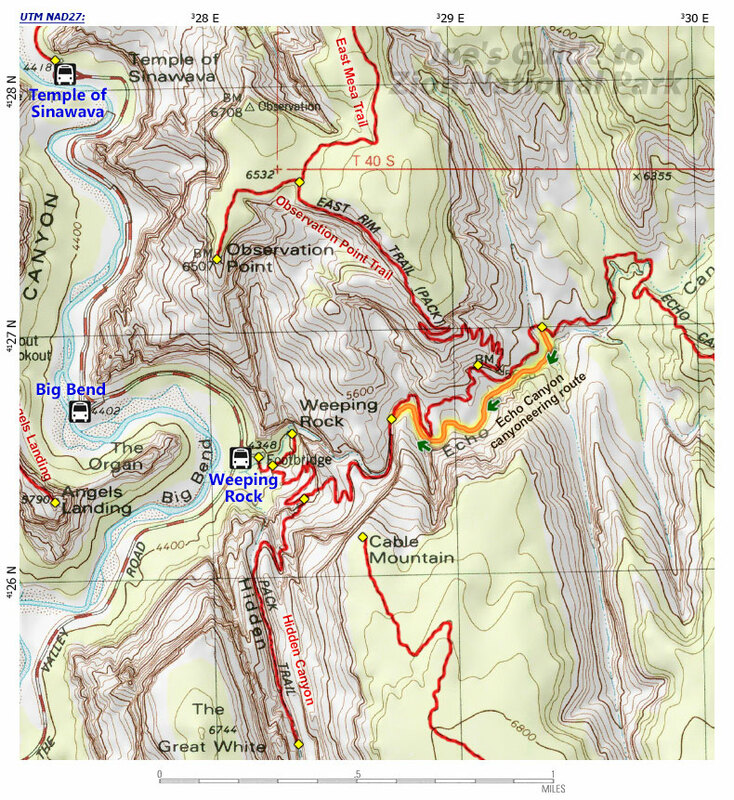 Elevation Change: 1100-ft ascent from Weeping Rock to drop-in point for Echo Canyon route. Equipment Needed: Enough rope for a 20' rappel (a 40'+ rope is convenient), climbing harness and rap device, climbing helmet, webbing and rapid links, drybag, climbing etrier or other escape devices for the semi-keeper pothole. Wetsuits are recommended even in the summer as the water is perpetually cold. Seasons: Late summer through fall. WARNING: In the winter, Echo Canyon collects a lot of snow and ice that does not melt quickly in the spring, so this canyon can be treacherous well into summer. Check current conditions at the Wilderness Desk. The standard Echo Canyon canyoneering route described here could take 3-6 hours total at an average speed with 1-3 hours spent in the belly of the canyon. Starting at the Weeping Rock trailhead, hike up the Observation Point/East Rim Trail as it zigzags up and out of the main canyon into the Echo Canyon pantheon. The trail briefly follows the dry streambed where you can peer into the narrow slot section just before the trail crosses over and heads above. The CCC-chiseled trail continues above the slot and soon enough you will reach the trail junction where the scraggly East Rim Trail splits off from the main and more popular Observation Point Trail. Follow the East Rim Trail as it skirts the shelves above Echo Canyon. Within only 5-10 minutes of hiking from the trail junction, you will cross the first major drainage. This is the standard and easy entrance into Middle Echo Canyon. Look for the trail of use that provides fairly easy access down to the bottom of the drainage. This drainage joins up with Echo Canyon proper and now the fun begins! Echo Canyon doesn't waste any time getting interesting. 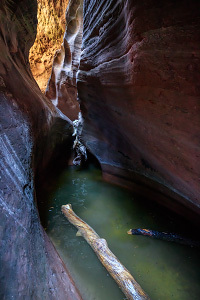 The next half mile of subterranean canyon involves four short rappels with floating disconnects (each roughly 20 feet), a handful of cold swims and several downclimbs. Rappel 1 is off of a chockstone (down canyon right) into a swimming pool. Swim around the corner to dry land and you're at Rappel 2 off of bolts into a typically shallow pool. Around the corner of the far side is a small little toilet bowl-like pothole with the bolts for rappel 3 on the far side. When the toilet bowl pothole isn't filled with sand, it's tall enough to be a bit of a challenge; partner assists can help dropping in and climbing out the other side, but there is only room for 1 or 2 people to sit on the lip to get on Rappel 3. Rap 3 goes into a larger dark swimming pool known as the semi-keeper pothole*. In low-water conditions, the exit can be several feet above water level requiring a partner assist or pothole-exiting tools and tricks to get out of. (This pool often collects a lot of plant material and has a reputation for being foul-smelling.) 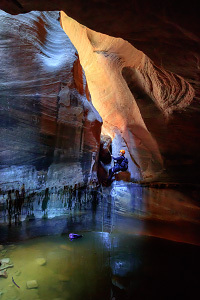 Once past the semi-keeper obstacle, downclimb into another dark swimming pool and on the far side, you will reach Rappel 4, another short rap into a beautiful carved sandstone chamber with another short pool at the bottom. Beyond the technical section, there is a fair amount of hiking through tall and dark corridors with several downclimbs past boulders and logjams and possibly a few swims. One of the more interesting sections is the canyon's namesake, the so-called "echo chamber" where the tall and curved shape of the walls makes for excellent reverberation. (Hikers on the trail above will be able to hear your singing.) Soon enough, you will be back to the world of the living where the slot section opens up and you rejoin the Observation Point Trail. *Semi-Keeper Pothole Warning: The difficulty of the semi-keeper pothole varies quite a bit. In easy high-water conditions, a beached whale move can get you out. In low-water conditions, this exit can be a significant challenge with the exit lip located several feet above water level, making climbing out extremely difficult. Be prepared to do a pack toss with a climbing etrier or some other method of pothole escape. Do not take this obstacle for granted; a few people have gotten trapped here and have required rescue. Check on conditions as you get your permit and if you are unsure, bring your pothole escape tools and know how to use them. HIKING UP MIDDLE ECHO: It is possible to hike up Middle Echo Canyon at the Observation Point Trail crossover, but typically several scummy pools and difficult logjam obstacles will discourage most from making much progress. In dry conditions, it is possible to hike all the way up to the Echo Chamber. LOWER ECHO CANYON: While this route description is solely for Middle Echo Canyon, canyoneers have occasionally descended Lower Echo Canyon, the section of canyon downstream from the Observation Point Trail crossover. While this is legal with a permit, it is not legal to exit the canyon by rappelling out over Weeping Rock. Lines must be fixed so you can ascend back up the canyon. 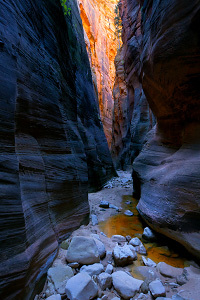 When you hit this canyon in fresh water conditions, this is an amazingly wonderful canyoneering experience. A step up from Keyhole Canyon, but less committing than Pine Creek (and arguably more beautiful than both), I'm surprised it's not as popular as some of the other "trade route" canyons in Zion, but perhaps the reputation for scummy pools really turns away a lot of people. Be prepared and equipped to deal with that semi-keeper pothole! When the water is low, this canyon becomes a more serious adventure.